A Virgin East Coast HST at Aviemore station. Transport Scotland’s Bill Reeve cannot think of a more exciting time for the railways of the Highlands. His comment was part of his presentation to the annual HITRANS (Highlands and Islands Transport Partnership) Rail Stakeholder Conference held at Inverness on 29th January. Other speakers illustrated why his comment was justified. ScotRail Alliance managing director, Alex Hynes, outlined ScotRail’s plans for the future, which included an increase in fleet size from 800 to 1000 vehicles over the next two years. With more intensive use this will provide a forty per cent increase in seat-miles. He advised the conference how new electric trains for Central Scotland would benefit the Highlands by releasing additional diesel trains for northern services. In addition, the introduction of ScotRail’s “new” High Speed Trains on is about to transform Scottish inter-city services as well as providing a fifty percent increase in seats on these routes. Completion of phase one of the Aberdeen to Inverness project will enable ScotRail to introduce an hourly Inverness to Elgin service in December. On the far north line, the ScotRail Alliance has done much to improve the service. Following the resultant increase in punctuality from 69 to 86 per cent there had been a seven per cent increase in patronage, the first increase for many years. However, this service was not without its critics. One questioner was concerned about the poor catering provision on the line. Hynes acknowledged that this needed to improve. Within an hour of this assurance, ScotRail has issued a press release advising that, following a recruitment drive, the catering service had now been fully restored. Peter Strachan from Caledonian Sleepers described the new sleeper trains being built by CAF in Spain which include en-suite berths, some with double beds. He explained how modern equipment in the new lounge cars will provide a much-improved catering service. To avoid jolts, both the trains and the class 92 and 73 locomotives that haul them, are being fitted with semi-automatic couplers. These new trains will first be introduced on the Lowland sleeper service from Central Scotland in October. 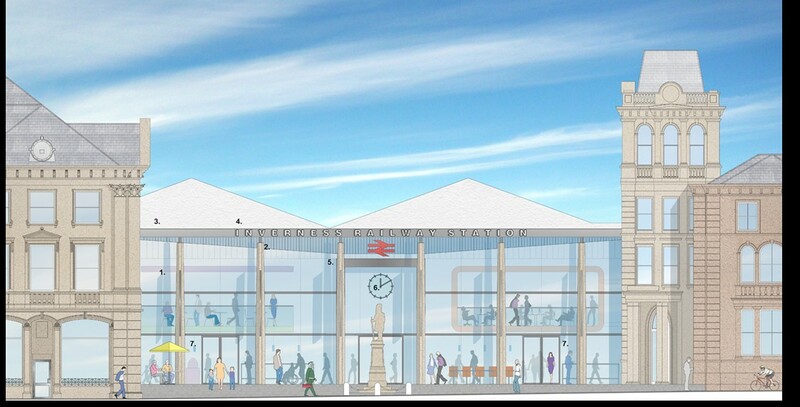 A CGI of what Inverness station could look like following its redevelopment. One possible use of the Mark 3 sleeping coaches displaced as a result is an overnight service between Central Scotland to both Inverness and Caithness to connect with the ferry to the Orkney Islands. James Jackson of Systra described how mobile phone data had been used to assess current travel patterns from the far north to derive an annual demand for this service. This was predicted to be 20,600 journeys per year to/from Inverness and 8,600 to/from the far north. Network Rail’s Graeme Stewart explained how the Highland main line upgrade will provide journey time improvements by enabling simultaneous arrival of trains at the loops at Pitlochry and Aviemore. This work will be completed in time for the full HST service in the May 2019 timetable. ScotRail’s Scott Prentice explained how this timetable was being developed to provide an average 12 minutes time saving between Glasgow or Edinburgh and Inverness. Other subjects presented at the conference included the £6 million revamp of Inverness station and its approaches, the importance of bikes on trains and Skyefall. This is a proposal for the Kyle of Lochalsh line to share three kilometres of its trackbed with the A890 road which has been blocked by ten rockfalls over the past twenty years necessitating a 130-mile detour. It will be interesting to see how this problem is resolved as many in the audience were sceptical of its option to replace trains with tram-trains driven on line of sight towards oncoming road vehicles that have to use passing places. Last but certainly not least, Hege Hernes and Kate Howie of the West Highland and Highland Main Line Community Rail Partnership (CRP)s explained their work to promote these lines and make them part of the community. Hege described how her CRP had commissioned a short play “Brief Encounters on the West Highland line” to be performed in the line’s tearooms. As an example of how rail could be promoted, Kate explained how in Norway, a special train, with performing artists, had toured the country to promote its railways and local communities. Over a two-month period there had been 350 broadcasts from this train that had been watched by three quarters of the population. 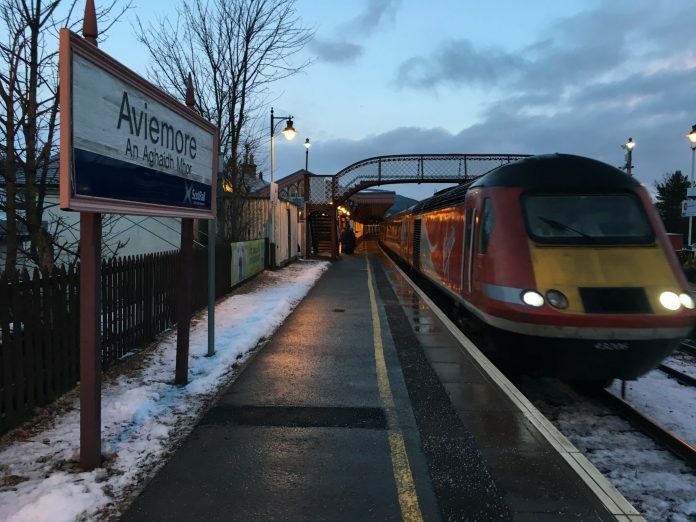 Inverness is 582 rail miles from London and for years there has been few changes to train services in this remote area. However, as the HITRANS conference showed, railways in northern Scotland are now receiving significant investments to significantly improve their services. For the Highlanders, these are exciting times indeed. A new bridge over the Dornoch Firth, please to cut times to the far north drastically, please. Scot Rail’s Scott Prentice explained how this timetable was being developed to provide an average 12 minutes time saving between Glasgow or Edinburgh and Inverses it is a nice plan for railways. The reason for the Route Study is to give a proof base that will illuminate funders in Scotland while considering rail industry venture decisions for Control Periods 6 and 7 somewhere in the range of 2019 and 2029. It is one of another age of Studies crosswise over Great Britain which will likewise set out how estimate development could be met through to 2043. This more extended term arranging skyline is purposeful: it empowers abroad scope of choices to be viewed as that assess improvements, for example, High Speed 2 and innovative headways, with a view to making an organized arrangement of decisions for the following 10 years and past.